Private Oscar French was one of Ontario's farm boys who went off to war and never came home. While serving as part of the Canadian Expeditionary Force to Europe in the First World War, he wrote dozens of letters to his mother back home in Waverley, Ontario. She saved them in a flowerprint cardboard box which eventually wound up in the hands of Oscar's nephew, Orland French. As a writer, Orland seized on the opportunity of creating a unique personal history of the First World War, even though he wasn't born until 1944, near the end of the world war that followed "the war to end all wars". He hopes to finish this project before the 100th anniversary of Uncle Oscar's death: April 9, 1917, on Vimy Ridge. 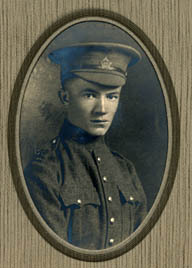 Oscar was a teenage farm boy when he enlisted in the Canadian army in 1915. During training, he became a machine gunner. As the famous attack on Vimy Ridge began on Easter Monday, April 9, 1917, he and another soldier were hit by shellfire. It is the intent of writer Orland French to incorporate his uncle's letters into a book on the First World War. Private Oscar French's name is recorded on the Waverley Soldier's Memorial. For photos, CLICK HERE. Oscar's name is second from the top under Tay Township. 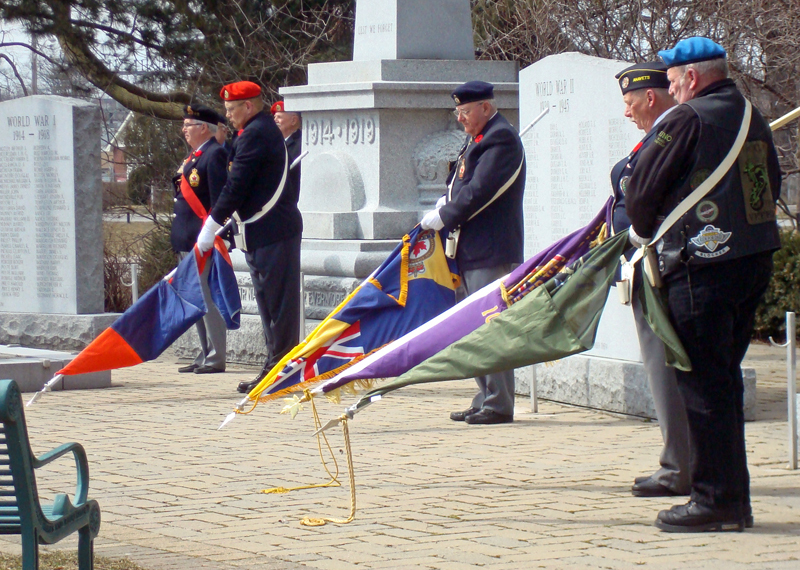 Every year the City of Belleville marks the Battle of Vimy Ridge, the Battle of the Atlantic and Victory in Europe at the Belleville Cenotaph in a ceremony in April. 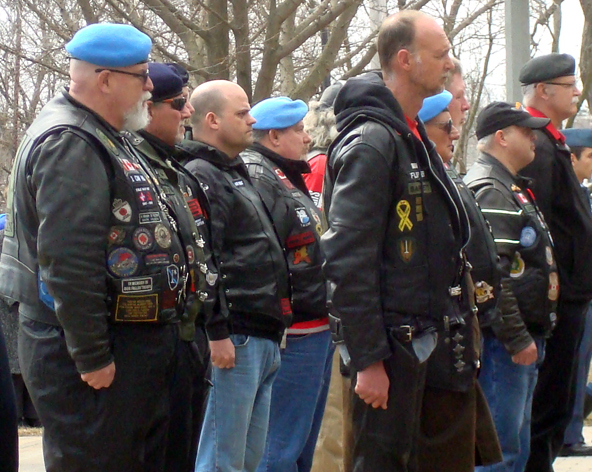 Below: Colour party with flags lowered at Vimy ceremony on April 7, 2013, at Belleville cenotaph. Pte. 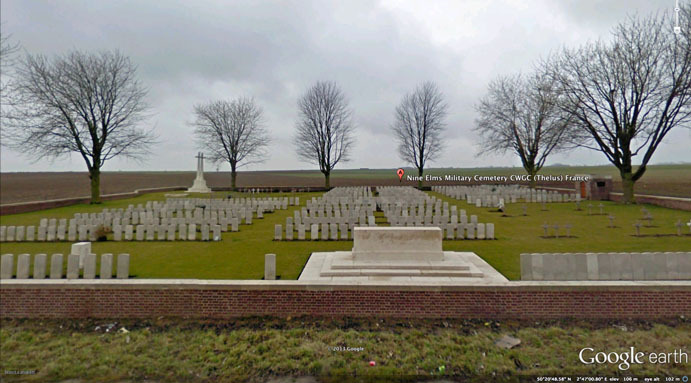 Oscar French is buried in Nine Elms Military Cemetery (Canadian War Graves Commission) near Thelus, France. The cemetery is identified near the bottom of the photo. Canada's Vimy Memorial is visible north of Nine Elms, just above the forested area. Pte. 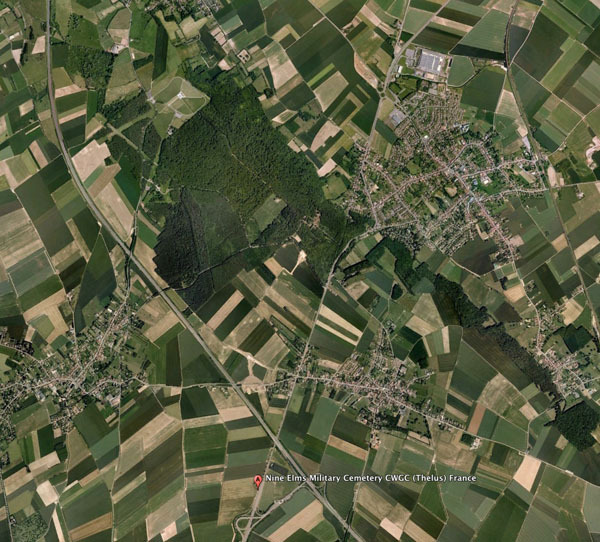 French was killed as his division was liberating the village of Thelus, a few fields to the north of his burial site. Photo from GoogleEarth. Nine Elms Military Cemetery (Canadian War Graves Commission) from a Google earth land camera. Pte. Oscar French is buried in a grave on the right side of the cemetery. 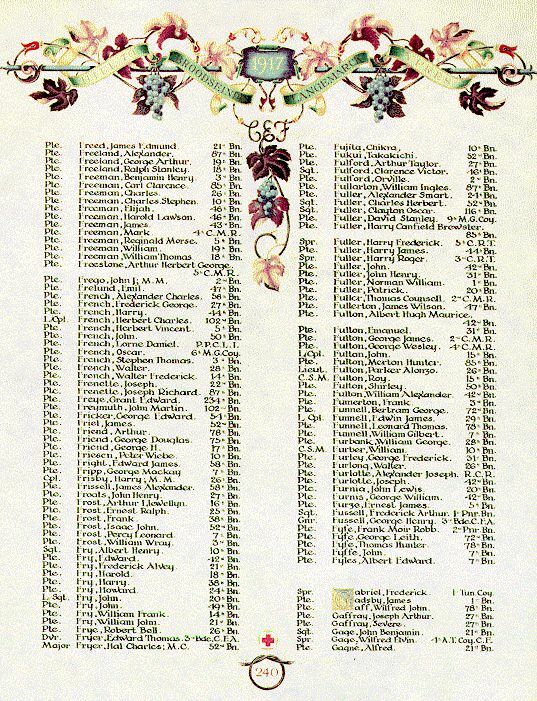 Page 240 of the First World War Book of Remembrance, showing Pte. Oscar French, 6th M. G. Coy. (6th Machine Gun Company) in left column. Private Oscar French, machine gunner, who was killed at Vimy Ridge on April 9, 1917. 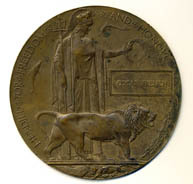 The family of each serviceman killed in the First World War received a bronze medallion engraved with the name of the deceased.